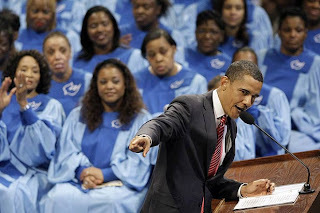 CreaTiff Chatter: Let's Talk About Music: Obama Encourages Fathers to "Step Up"
CHICAGO (June 15) - Barack Obama celebrated Father's Day by calling on black fathers, who he said are "missing from too many lives and too many homes," to become active in raising their children. "They have abandoned their responsibilities, acting like boys instead of men. And the foundations of our families are weaker because of it," the Democratic presidential candidate said Sunday at a largely black church in his hometown.